Renaissance is a band with a rich history unique unto themselves as progressive rock pioneers who rose from the ashes of the seminal UK rock band, The Yardbirds. Their career has spanned forty plus years spearheaded by the 5 octave voice of Annie Haslam and the masterful songwriting skills of Michael Dunford. The band also featured John Tout on piano, Jon Camp on bass and Terry Sullivan on drums, all of whom further molded the sound of the band through the powerful technical command of their instruments. They were first acknowledged for uniquely blending progressive rock with classical influences and symphonic arrangements. Renaissance are widely considered to be the band that most successfully and routinely utilized the sound of a full orchestra in their recordings. In the early years, Renaissance toured Europe extensively. It wasn’t long before influential progressive rock stations in the US, such as WNEW (NYC), WMMR (Philadelphia) and WHFS (Washington) were turning America on to Renaissance. Before too long the band started thrilling concertgoers on the world’s most distinguished stages, from Carnegie Hall in NYC (with the New York Philharmonic Orchestra), to the Royal Albert Hall in London (with The Royal Philharmonic Orchestra and Royal Chorale Society). In 1978 they had a top ten hit in the UK with ‘Northern Lights’, which has become a classic radio favourite, still demanding regular airplay to this day. The band eventually disbanded in the late 1980’s at which time Annie Haslam launched a solo career. In celebration of the 40th anniversary of the original founding of Renaissance Michael and Annie in 2009 decided to form a new touring band which consisted of; Rave Tesar on keyboards, David J Keyes on Bass, Tom Brislin on keyboards, Frank Pagano on drums. In 2014, Renaissance released their first album in 13 years entitled ‘Symphony of Light’. The album is a testament to the unforgettable melodies that Michael Dunford infused into his work (Michael died prematurely in 2012). The album begins with powerful lyrics by Annie Haslam in the title track about the life of ‘Leonardo da Vinci’, followed by ‘Waterfall’, a song written about the rainforests in Brazil. The album’s music will bathe the listener in sonic flavors from far off countries, lush orchestral arrangements and unusual lyrical content, and with guest appearances from Ian Anderson (Jethro Tull) and John Wetton (Asia/King Crimson/UK). The Band have most recently toured North America, Canada, and in May 2017 had a triumphant tour of South America. 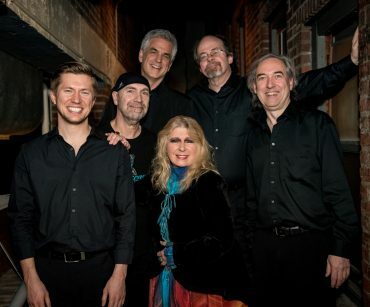 The current personnel of Renaissance include: Annie Haslam lead vocals, Rave Tesar keyboards, Leo Traversa bass guitar, Geoffrey Langley keyboards, Frank Pagano drums and Mark Lambert on acoustic guitars. There are not many better ways to start off a New Year than new concerts announcements! So we are happy to report that Renaissance will be touring Brazil this spring! Check out Annie’s invitation to South American fans on the Renaissance Youtube page and sign up for their touring tracker for updates. Renaissance is Cruisin’ to the Edge this week with fellow rockers Yes and Steve Hackett (and many more) from sunny Florida to the Caribbean…. Fun, sun, and music? We’re not jealous or anything. Here’s a great shot from Steve’s twitter page.